The Smithsonian’s National Air and Space Museum has begun the first major phase of the renovation of the building on the National Mall with the closure of nine galleries. Lane and sidewalk closures around the building on Jefferson Drive and Seventh Street began in early January and will remain in place for the next three years. The exhibitions now closed are on the west side of the museum—“America by Air,” “Sea-Air Operations,” “Military Unmanned Aerial Vehicles,” “Golden Age of Flight,” “World War II Aviation,” “Jet Aviation” and “Legend, Memory and the Great War in the Air.” Some of the artifacts that are off display with these closures include the Douglas DC-3, Boeing 747 nose, Supermarine Spitfire Mk.VIII and the Hughes H1 Racer. The reopening of the west-wing galleries is scheduled for 2022. The sidewalk and curb lane will be closed. 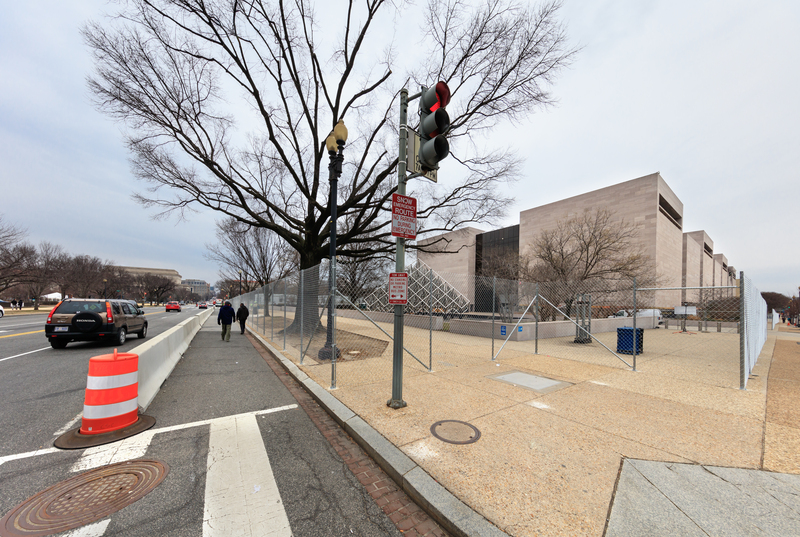 Pedestrians walking along Jefferson Drive will need to use the sidewalk on the National Mall side of the street. The current traffic lane will continue to operate as usual. Vehicles will not be permitted to stop or stand in this lane, as it will impede traffic flow. Public parking will be permitted on the far-left lane, except between the hours of 8 p.m. and 7 a.m. when the center (traffic) lane will be used for deliveries. This segment of the street will still be open, with the curb lane along the museum side (or south side) of the street only available for drop-offs. Public parking will continue to be offered along the Mall side (north side) segment of the street. The sidewalk will be closed and the curb lane will become a pedestrian walkway separated from traffic by barriers. The Metrobus stop that that was at the southeast corner of Seventh Street and Jefferson Drive has been moved up the National Mall to the northeast corner of the intersection. This portion of the sidewalk may be closed during evenings and Sundays for deliveries for the construction. The curb lane will also be closed in the evenings and on Sundays.